Well to say that yesterday was a slow news day would be an understatement. The official site brought us the truly shocking news that its official twitter page has reached the grand total of 300,000 followers. I know! Amazing. But in all seriousness the guys at the official site do a good job and they should rightly feel proud of their achievement. The amount of followers also makes the club the most followed Premier League side on Twitter. If you haven't got an account you should join up. I'm an addict. There was also the news that Festive Members Day, which was due to take place today, has been cancelled because of the weather conditions around the stadium. In tandem with the cancelation of Members Day, the Junior Gunners Christmas party was also snowed off. This is the second year in a row the Junior Gunners party has been called off. I hope the club arrange something for our young followers because I know all of these youngsters feel let down. Last year I don't think they did rearrange the party. I hope this year they will organise something - perhaps in the February half term - to make up for their disappointment. And on to matters football. The Daily Mirror pick up on the Al Jazeera interview I brought you on Sunday, with the line about Arsenal no longer being able to keep up with the spending power of Manchester City and Chelsea when it comes to signing big name players. Denilson has spoken to Brazilian newspaper O Globo about his future at Arsenal. "I am presently happy with Arsenal but I am a professional player and I can never discard anything in my future." I think it would be a regressive step if we started selling our fringe players. Looking at the stats from two seasons ago, 2008-09, Denilson made the most passes in the Premier League of any player. He was also the Arsenal player who made the most tackles. When he gets a run in the team, you can see how effective he can be. But he does the simple but effective things well and allowing more creative players to get on the ball. It's like the situation with Nicklas Bentner. He can't get himself back in the team because of the good form of Marouane Chamakh and Robin Van Persie working his way back to full fitness. But he is an essential member of our squad. We need players with experience and Bendtner has 69 first teams starts and 65 substitute appearances in three full seasons. He's going into his fourth full season with the club since turning professional and has told the official site he's determined to break back into the first team. 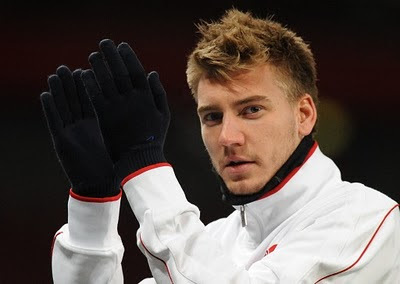 I'm sure Bendtner, who has also been out injured for the majority of this season, will get a good number of game before the end of the May. There is no way that Van Persie can last the rest of the season without getting crocked again. And Chamakh has given his all in every game he's played. He's certainly due a rest. And perhaps the snow has come at the right time to give the Moroccan at two week break. Elsewhere Wojciech Szczesny tells the official site about the day he broke both his arms in the gym at London Colney.